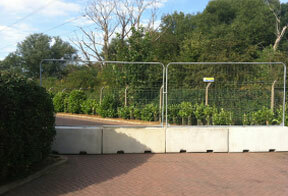 Concrete barriers for Heras fencing provide a cost-effective, yet sturdy fencing solution. You can fit your Heras fencing into our concrete blocks to create a secure barrier without affecting visibility, making them a perfect solution for events, exhibitions and various other applications. Take a look at our standard sizes below and then visit our before ordering and site preparation pages for advice on placing your order. All measurements are in mm.